The name of this dress was very appropriate to the weather that was going on when I took these photos as there were gale force winds that were literally almost blowing me over whenever I stepped outside which led to the dreaded clipping back of the fringe and hair (bushy hair + bright lipstick + wind = not a good look). Anyway I was sent this gorgeous dress by ROMWE and I love it. It's so quirky and I don't think I've seen anything like it before with the arty print; teamed with the leather jacket and patent boots it makes for a great rock chick kinda look. 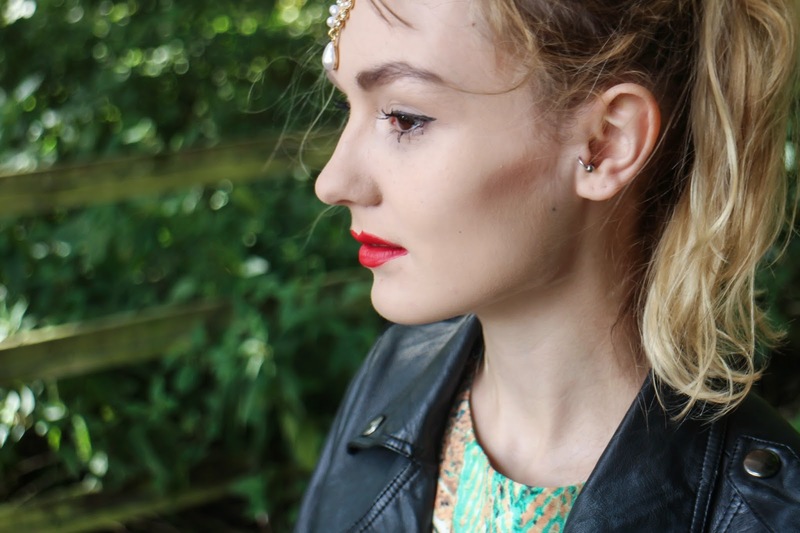 Also you might have noticed that I got my tragus pierced! Yes going out for pancakes with my friend Jess ended up with a random hoop in my ear and a bar through hers; she's a bad influence!!! I absolutely love it and it was definitely worth the pain of the piercing itself - ouch! Gorgeous look, you look amazing! That's such a gorgeous dress! The print is so unique, and I love the colours on it! 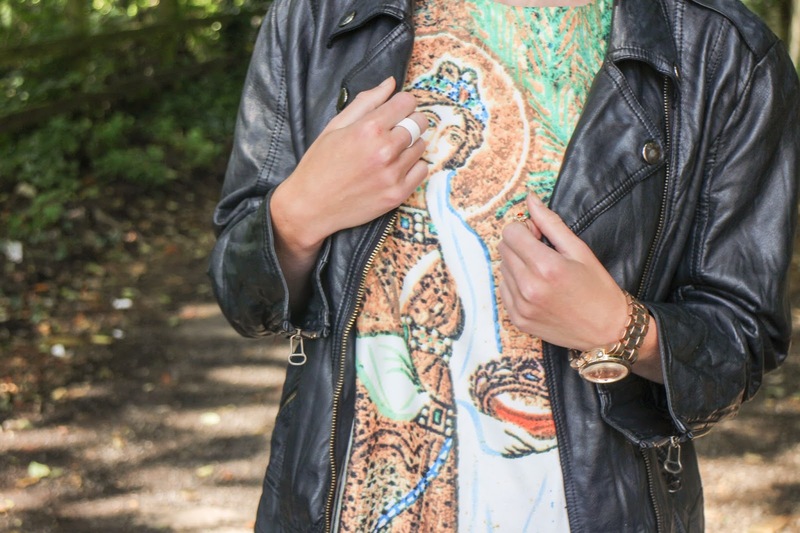 It looks great teamed with the leather jacket, great choice! You look so stunning here! You've definitely got the most amazing cheekbones. The dress is gorgeous, I love it teamed with the leather jacket too! 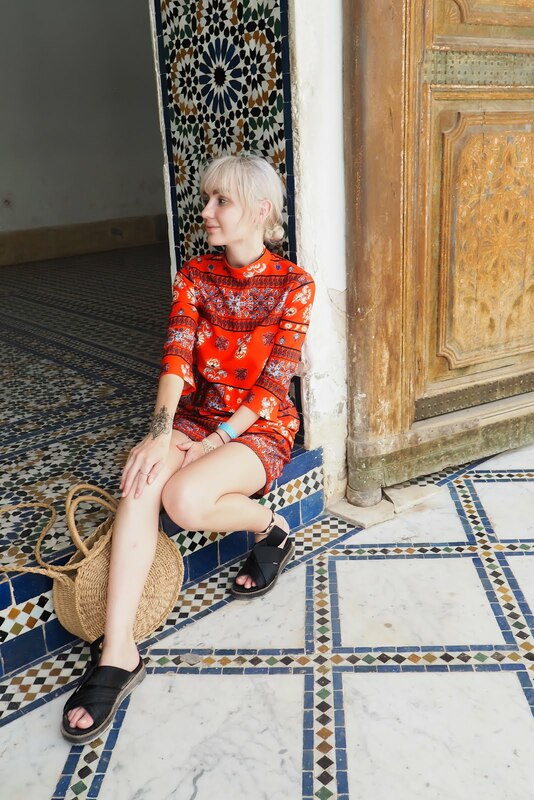 This is such a lovely outfit post, you look amazing! 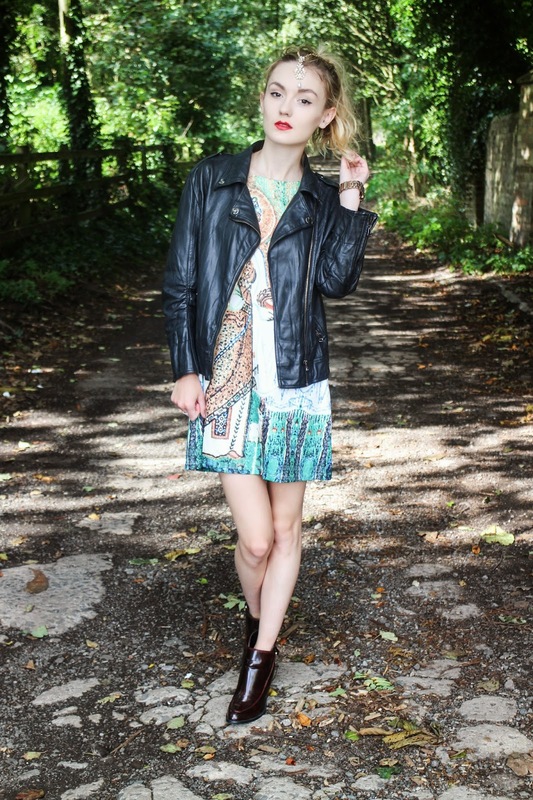 Totally love how you styled that printed dress. I love the color combi. love the boots, look amazing as always! Such a lovely post and pictures! I would love to get my tragus pieced by i'm such a wimp with things like piercings! Omg in LOVE with that dress!! Such a gorgeous print :) And love your head piece too - awesome style as always! I love your hair like this! The dress is gorgeous as well! Really like how you've styled this Amy you look amazing, just recently started following and I'm already a fan! Love the tragus hoop too. Love the oxblood color on your boots! So cool always, love your style! gorgeous photos! Love the leather jacket! I love this look and it is just right for the season - somewhere between summer and autumn! spot on! Wow, absolutely stunning!! 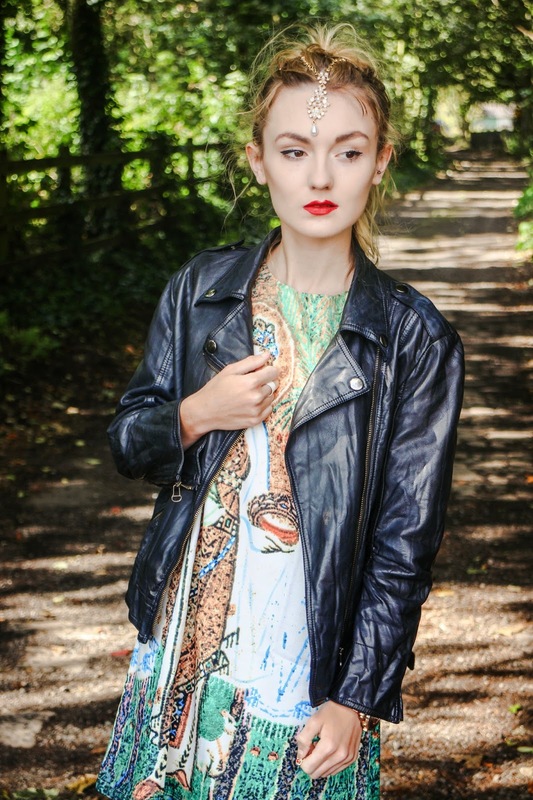 I love everything about this look from the print of the dress, to the leather jacket and of course, the gorgeous headpiece! Love your style! you look so elegant and lovely!! love your boots so much!! i'm so in love with your hair and headpiece! you look absolutely beautiful. I have my tragus, cartilage, rook and lobes pierced and always end up getting them done on a whim - best time for it. Beautiful accessories! Your headpiece is awesome!